'Miserable Lie' was the song where it all clicked for me. On previous attempts to appreciate the Smiths I had found them morose and impenetrable. But one evening in 1997 I decided to give their first album a go and by the third track I was completely hooked. Everything great about the Smiths and their singer Morrissey is present in 'Miserable Lie'. It starts off slow and mournful and then suddenly transforms into a melodramatic and self-deprecating teenage diary entry about being really terrible at having it off, sang in falsetto. It's a very silly song and I love it. After that I got all the other Smiths albums and found the same mixture of camp, wit, melodrama, self-deprecation, and sincerity. I loved Johnny Marr's music but it was Morrissey's voice, lyrics, and persona that really drew me to the band. It's not hard to see why songs about misery and loneliness and being really terrible at having it off would appeal to a teenager, but lots of bands offer that. Morrissey delivered it all in a unique, over the top way that echoed how huge these things seem to a teenager while at the same time acknowledging how ridiculous it all was. Another aspect of Morrissey that appealed to me was his honesty. He was unapologetically a pop star, but he was doing it his way. Even with all the imitators that followed him he was still like no other pop star around. And if occasionally he had said some problematic stuff in interviews, well, that's what happens when you're uncompromising. If you speak what's on your mind without dressing it up to protect your image like all the other pop stars then occasionally you're going to say some things that get you into trouble. 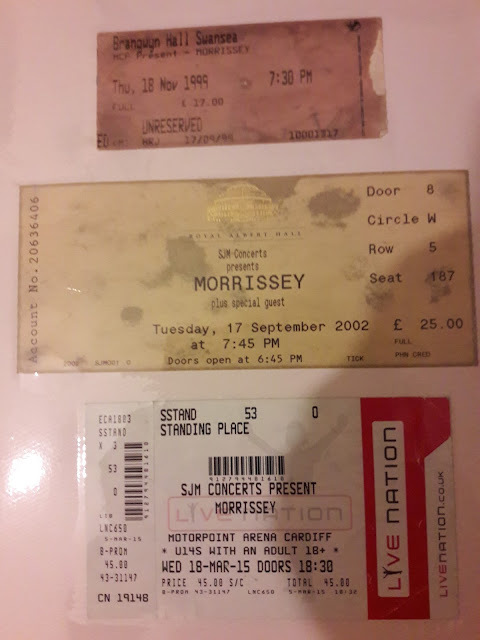 In 1999 I saw Morrissey live for the first time. It was a couple of years after his poorly received album, Maladjusted (which I loved) and he was in between record contracts. I was in the first year of University at Swansea and I couldn't find anybody to go with me, so I went on my own. When I bought the ticket in a local record shop about a month in advance I asked the girl behind the counter if there were any tickets left and she laughed, "yeah, a few". On the night of the gig I got a taxi from the Student Village to the Brangwyn Hall and the taxi driver said "Morrissey? He's an old has-been isn't he?" Brangwyn Hall was only half full, but everybody there was completely devoted to him. Morrissey opened with 'You're Gonna Need Someone On Your Side' and he swished and cracked the microphone lead like a bullwhip. At one point he threw his West Ham United t-shirt into the crowd and two men gripped on to either end of it in a sweaty tug-of-war, neither one willing to let the precious memento go, until Morrissey himself had to intervene. He also threw a banana into the crowd and a few years later I befriended the girl who had caught it. She kept it in her freezer for two years until a power cut defrosted it and turned it to mush. He finished the night with an encore of the Smiths' 'Last Night I Dreamt Somebody Loved Me'. Every single person in the audience knew every lyric to every song. Before Morrissey came on that night a group of 'lads' behind me had been chanting "WE LOVE YOU MOZZA, WE DO". They spotted an Asian teenager in front of me who was standing by himself and they began to chant over my head "IT'S BRUCIE LEE! WE LOVE YOU BRUCIE! WE DO!" I remember rolling my eyes and thinking that this must be an example of the racist contingent of Morrissey fandom that I'd heard something about. I did nothing to help the teen. Halfway through the set the teen ran onto the stage and hugged Morrissey, whispering desperately in his ear as the bouncers dragged him away. After that gig I went from being a fan to a devoted disciple of Morrissey. Throughout my teenage years a combination of being bullied, a desperation to be liked, and my own cruelty had turned me into the most craven, weaselly kind of bully. During my time at University I had begun to deal with the great shame I felt for my behaviour and I spent most of my time ruminating on my deeds and hating myself. In retrospect it's no wonder I became obsessed with a man who seemed to apologise for nothing. I hated the NME but would buy it every time it had the smallest paragraph about Morrissey, even if it was slagging him off. I learned about how the NME had turned on Morrissey and accused him of racism. During conversations about him I would say things like "if you actually listen to the lyrics of 'National Front Disco' you'll hear that while he may be singing from the perspective of a would be member of a fascist party, he's not actually signalling any approval of the song's protagonist's choices." I never mentioned the songs 'Bengali in Platforms' or 'Asian Rut' much. With the release of You Are The Quarry in 2004 Morrissey was popular once again. He seemed to have made friends with the NME, and there was a documentary about him on TV narrated by Christopher Eccleston where he had tea with Nancy Sinatra and Alan Bennett. It became easier to ignore the odd "dodgy" song and all the videos with skinheads in them. I still listened to the Smiths and Morrissey every day. I bought bootleg videos of his concerts and downloaded B-Sides and Morrissey covers of Bowie songs over Limewire. I became a vegetarian for two years. Morrissey would continue to give interviews and in each one there would be something that stood out. Ill informed comments about immigration, or a dig at the Chinese. Over time "he says the odd dodgy thing" became "I don't agree with anything he says but I love him", which eventually became "I try and separate the art from the artist." By the time World Peace Is None Of Your Business came out in 2014 I had decided that there was Morrissey the man, who was immature, ignorant, and out of touch with the real world, and there was Morrissey the fictitious pop star persona, who had spoken to me through his music as a teen and who I still loved. This was enough for a while, even in 2016, when he hailed the loathsome Nigel Farage and George Galloway as "liberal educators". And then came May 2017, when Morrissey used the Manchester Arena bomb attack as an opportunity to deliver a racist dog whistle rant on Facebook that earned him the approval of far-right bastards of note, Paul Joseph Watson and Milo Yiannopoulos. This was followed a few months later by an interview in which he gave a victim blaming defence of Kevin Spacey, who had been facing allegations of sexual abuse. I realised that I was embarassed to be known as a Morrissey fan. He wasn't just a man whose politics differed from my own. I had a picture of a racist and an abuse apologist above my desk at work and I was suddenly mortified. I am not judging anybody who can still separate the art from the artist. I wish I still could. I would love to be able to still listen to 'There Is A Light That Never Goes Out', 'Reel Around The Fountain', 'Bigmouth Strikes Again', 'Rusholme Ruffians', 'Why Don't You Find Out For Yourself', 'Trouble Loves Me', 'Late Night Maudlin Street', 'I Know It's Gonna Happen Someday', and the rest without getting angry at myself. I probably will again some day. But for now, I'm not angry at myself because I listened to and loved the music of someone with problematic views. I'm angry because the one thing I can't accuse Morrissey of is deceiving anyone. After all, one of the things that first drew me to him was his honesty. Morrissey has always told us who he is. I deceived myself.